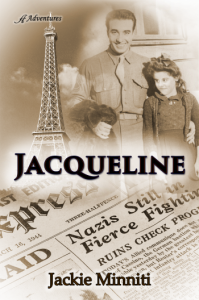 The following is a guest post by Jackie Minniti, author of Jacqueline. If you would like to write a guest post on my blog, please send me an e-mail at contact@cecilesune.com. When I retired from 25-years of teaching and started my second “career” as a writer, Dad began urging me to put the story on paper. I explained that, while the family loved his narrative, it would not interest the average reader. Besides, while there might be enough material for a short story, there certainly wasn’t enough to fill a book. But the seed had been planted, and Jacqueline took up residence in my mind, a character in search of a story. I found myself drawn to the faded pictures in my dad’s old photo album where a little girl with dark curly hair smiled back at me. What was it that drew her to my father? Where was she now? Did she ever think about the girl in America who became her namesake? For as long as I can remember, I’d dreamed of becoming a published author. When I finally typed “The End,” I knew that this was the book that would make it happen. 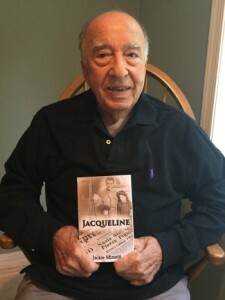 Sure enough, the manuscript was picked up by Anaiah Press, and I was rewarded with the proudest moment of my life – putting that book in my father’s hands. And the most ironic thing of all is the way “average readers” have embraced the story. I guess this goes to show that, if you wait until the stars and planets align just right, even your wildest dreams can come true. About the author and her work: Jackie Minniti’s Website. Jackie is currently a columnist for The Island Reporter in St. Petersburg. She is a member of the Florida Writers Association, the Bay Area Professional Writers Guild, and the Society of Children’s Book Writers and Illustrators. Several of her stories have been included in Chicken Soup for the Soul collections. She lives on Treasure Island with her husband, John, and two noisy macaws and enjoys reading, walking on the beach, boating, and visiting her three children and six grandchildren in New Jersey. Jackie has been a featured speaker at schools, book clubs, women’s clubs, and libraries and writes a blog featuring Florida writers (www.fabulousfloridawriters.blogspot.com).